Look! 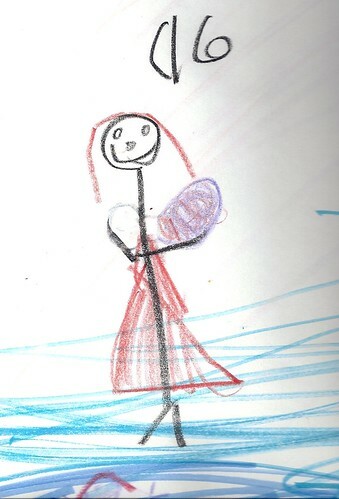 Addie drew me a picture for my birthday…it’s her! Then there were the turtles. Only it was more well. turtle-ish. But the turtles still never explained themselves. That’s a lot for just one week! You know, I never ever considered how turtles…. Nothing says “you’re getting older” quite like your child telling you they’ll have a baby at 16 (I’m choosing to ignore the babysitting clarification for the sake of my joke). Addie. Sweet, sweet Addie. Glad she was just babysitting. Haaaaaaaa! Unfortunately, this is not the first time I’ve seen turtles do it. Apparently my husband and I are like aphrodesiacs for zoo animals–they mate every single time we’re around. EW! Those turtles have issues. That’s all they EVER do. We’ve also seen the giant tortoises — you know, the ones that “race” to their outside home to start the month of May. Everyone jokes about being like rabbits, but I think they should be joking about the Indy zoo turtles. Your little artist, what a great picture. I bet it just made your heart melt. My 3 year old already talks about having a baby in her belly. I am in trouble with that girl. Hope you didn’t have a near fatal heart attack! This is so funny! We went to the zoo and saw two turtles doing the same thing! Must be that time of year! You might want to lock her up now. Mom, I’m pregnant! HAPPY BIRTHDAY! Best birthday ever. You know, it’s just not a good trip to the zoo unless there are animals going at it. Glad you enjoyed your BIG day and that you are still alive after seeing the drawing of your 16 year old with a baby!! I really enjoyed how you spaced out the c l i c k s because really… they’re turtles, and they’re slow. But honestly… somebody celebrated your birthday with a bang. Hahaha. Yeah, it took me all day to think of that. Oh, that made me laugh! And I’m sure you laughed too, after you found out that she was just babysitting and your pulse returned to normal. Those are the horniest turtles! They do that ALL everytime I’m at the zoo. that is an amazing picture! I just didn’t know?